These are just a sampling of the 180 questions that the justices of the Supreme Court of Westeros convene to address and definitively answer. Using their intimate expertise of both A Song of Ice and Fire, specifically, and George R.R. Martin, generally, from their years of writing, studying, reporting on, and podcasting about the phenomenon that is Game of Thrones and its source books, they are able to provide an analysis that is always penetrating and occasionally irreverent. Who, exactly, are the judges? Amin Javadi is a co-founder and -host of A Podcast of Ice and Fire, the longest-running (and award-winning) podcast devoted to all things Ice and Fire. Stefan Sasse is an essayist at the venerable Tower of the Hand, co-host of the Boiled Leather Audio Hour, and the purveyor of The Nerdstream Era, where the Supreme Court of Westeros goes into session every week. Both are contributors to the two Tower of the Hand ebook anthologies, A Flight of Sorrows and A Hymn for Spring, providing some of the strongest sections of each. Joining them are a cavalcade of guest judges, ranging from such big-name celebrities in the Song of Ice and Fire fandom as Elio Garcia and Linda Antonsson (authors of The World of Ice and Fire alongside George Martin himself) to a large variety of readers and fans from the various forums and communities from around the Westeros web. Looking to reconsider your theories of what is happening in Martin’s sprawling story or, even, to stumble across your new favorite crack-pot theory? 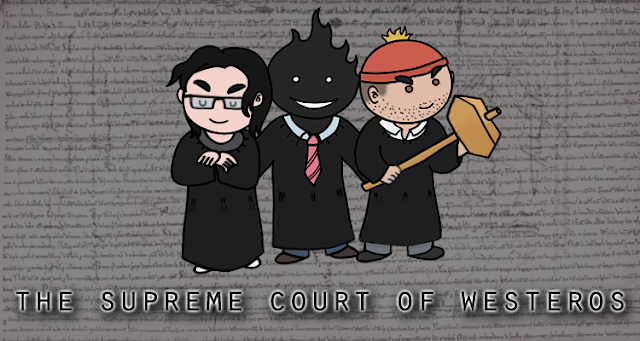 Look no further – The Supreme Court of Westeros (Volume 1) will be the perfect companion in your wait for the next novel, short story, or television season.